Well, we're almost there. 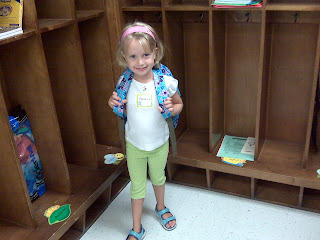 We're almost through the first week of Caroline's public school education! And even though she's only gone a total of 4 hours so far, it sure does seem like it's been a LOT longer. First of all, BCPS does a gradual kindergarten opening which means that they don't start like all the other kids. Basically, 1/2 the class had a 40 minute orientation on Monday and the other half on Tuesday. Then, 1/2 the class had a half day yesterday and the other 1/2 had a half day today. Finally, tomorrow will be the first full day with all the kids together. Whew! And don't forget the back to school meet and greet we attended last week. Oh yeah, and back to school night is Tuesday evening. And add to that that in the midst of all of this, Bryce has his 4 year check up, Piper had to get her 1 year blood work done, the fridge broke down, we had to go shopping for another, and wait for it to be delivered tomorrow. This whole week has been so sporadic. I feel like my head just isn't on straight. Let alone all the forms I've had to fill out for Caroline too. (And this was after our busy weekend last week.) I need a vacation please. But, all is well that ends well, right? 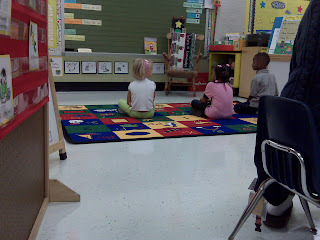 So far, Caroline has said that she loves kindergarten and that she loves her teacher. I could tell she was feeling a little tentative this morning but she told me when she got home that she was sad when I left but she just went and sat on the mat and basically told herself she could do it! I was very proud to hear that! Plus, she just couldn't say enough about how much fun she'd had. She's a little wary of tomorrow being a whole day but I reminded her that a whole day of school is shorter than when she spent a whole day at daycare and that seemed to help her some. I think she gets more worried/anxious about things when she's tired. Honestly though, I'm a little anxious myself about remembering all the stuff that we need to do between forms, lunches, snack, the signature calendar, etc. I think we'll just need to find our groove. My favorite quote from her through all these days aside from all her little excited remarks was when she told me that at the end of the day today, Ms. R asked the kids what they wanted to learn this year and Caroline said, "I want to learn about computers and the world!" Chip off the old block - made me so proud! Oh and for those who know how much I was worried about crying myself today, I didn't. I have my mom and MIL with me so they could learn the drop off drill and I think because so much was going on, I didn't even have time to feel sad. Although I wondered about her pretty much every second I was gone. Thankfully hearing she's already made friends and loves her teacher, definitely helps! And now, for the photo dump! My 3 kids on C's first official day - I have a similar one of me and my siblings on my first day of kindergarten. She actually requested pigtails this morning (which is unusual!) and I just think she totally rocks 'em!